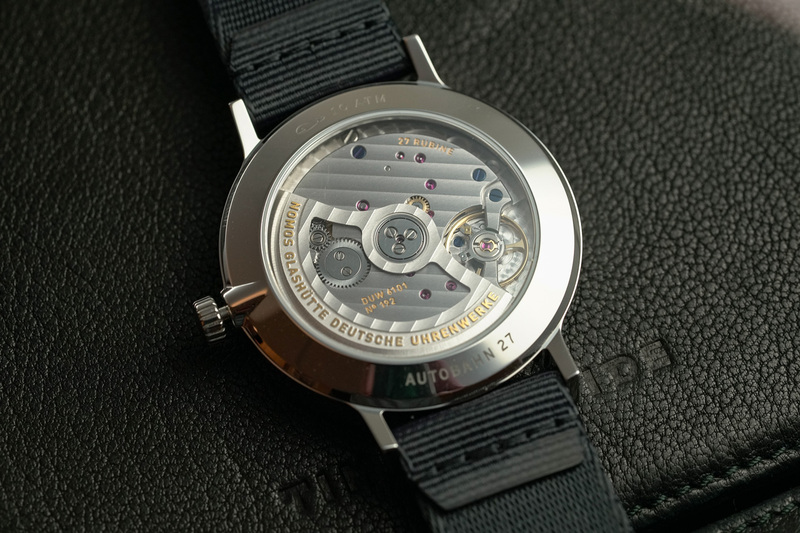 Styled by renowned product designer Werner Aisslinger and his creative partner Tina Bunyaprasit, the Autobahn deviates from the German brand’s usual minimalistic palette, and introduces a whole new side to the Nomos catalogue. 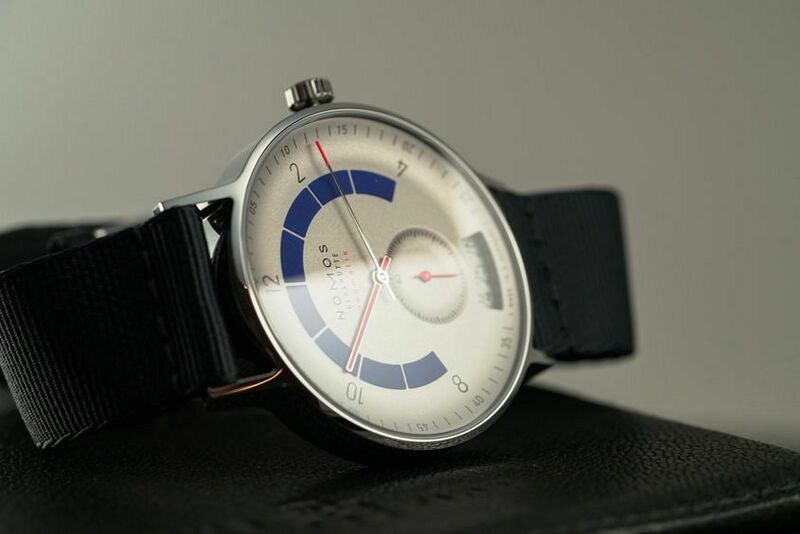 I’ll admit that when I first saw pictures of the Autobahn, I was left scratching my head, with the automotive-inspired design (the watch is a tribute to the famously speed-limitless highway system) was not something I ever expected to see. However, after getting my hands on one – during one of the more fun appointments at this year’s Baselworld – its purpose became clear in my mind, and my heart was quick to call shotgun. 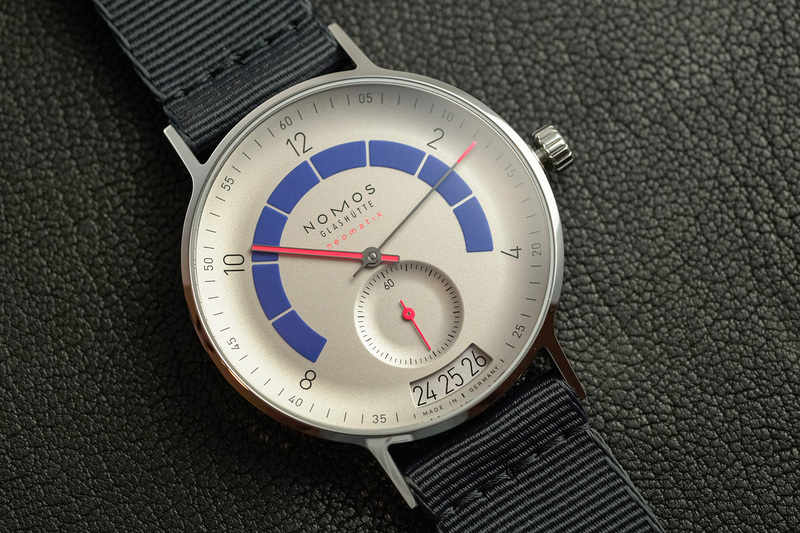 Remaining distinctly Nomos, the Autobahn adds a dash of driving sportiness to the catalogue. The bowl-shaped dial (in sports grey, midnight blue or silver plate) is modelled on the inclined surfaces of a racetrack, curving down towards its centre, and then further again on the sub-seconds dial. Spanning two-thirds of the way around the dial is a segmented luminous ring, reminiscent of a speedometer. And an extra-large elongated date window at 6 o’clock bears a resemblance to a dashboard odometer of a car. A newly developed in-house movement ticks away inside – the DUW 6101 – sporting a power reserve of 42 hours and an ingenious date mechanism that can be set either forwards or backwards at any time of the day, except for during a small 90-minute window surrounding midnight (45 minutes either side). The 41mm wide and 10.5mm stainless-steel case is water resistant to 100 metres with a domed sapphire crystal on both the front and back. And 20mm wide lugs hold a woven textile blue-black strap to fix the Autobahn to your wrist. There’s a notable presence when wearing the Autobahn. 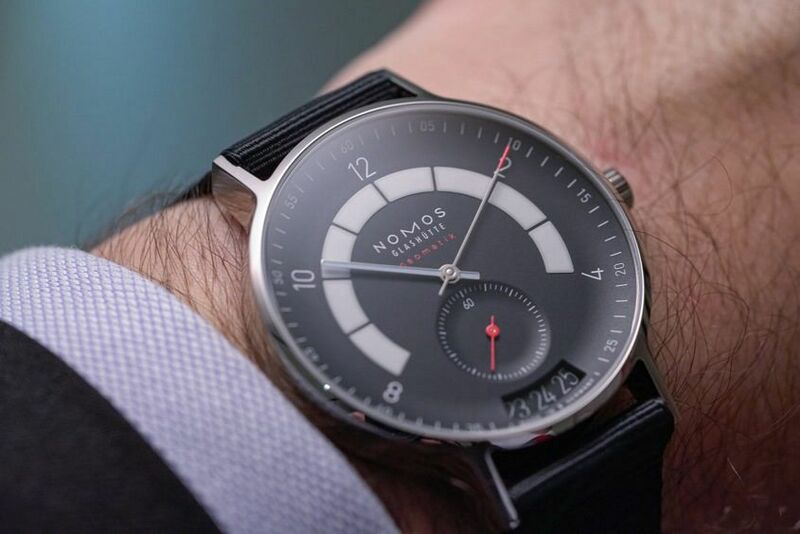 The case is large – by Nomos standards – and like most Nomos designs, it wears larger than its “on-paper” dimensions. There’s plenty to catch the eye when it comes to the dial, especially when the lights go down and the “speedo” lights up. And overall, the Autobahn is styled with a sporty robustness that until now, was mostly lacking in the Nomos catalogue. If you’ve ever found the German brand’s designs a little on the small side or maybe a little too minimalist, then the Autobahn is for you. 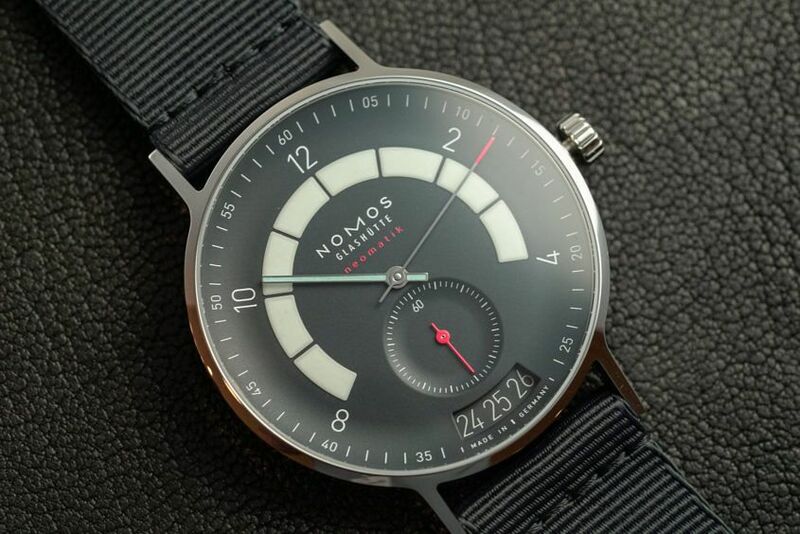 And although its funky design might upset some of the Nomos faithful, it’s sure to appeal to the automotive enthusiast. Honestly, there were a few. From an auto-inspired design from Nomos, to the curved dial that is literally layered with lume.